Outpatient rehabilitation clinic that focuses on sports medicine and aquatic therapy. Sam focuses on the exercise portion of the treatment and uses functional body weight tasks to help improve strength and endurance. 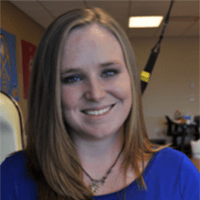 She enjoys working with young athletes and active individuals with lower extremity injuries such as ACL reconstructions. She is CPR and AED certified. Sam is currently studying to become a Physical Therapy Assistant at Concorde Career College and plans to graduate in June of 2019. Sam has lived in Colorado most of her life and loves the Colorado lifestyle. She spends the majority of her time training with her horse Spyder for 3 day Eventing competitions year round. When she isn’t doing that she is either hiking, snowboarding or playing with her dogs.